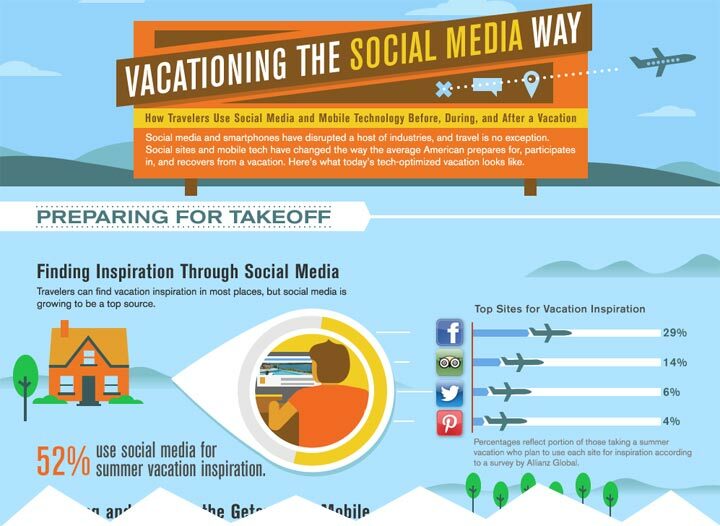 Social media and online resources have changed the way we travel these days. From itinerary planning to in-destination activities, and what do we do after coming home, we rely on internet and its resources heavily, as shown in the infographic developed by MDG Advertising. With more and more sites like Travelope, Groupon, TravelZoo, LivingSocial, etc. offering deals for the consumers and resources like TripAdvisor, Gogobot, Gtrot, etc. using Facebook, Twitter and other social media websites to offer personalized and friends’ reliable content, people are ditching their travel agents and getting online to plan their next vacation getaways. And with so many apps out there for mobile devices, research shows that 74 percent of social media users check their social sites and 72 percent of adults are likely to use their mobile devices during their trips. Travelers have multiple uses for their mobile devices throughout their getaways, with a full 68 percent using them to stay in contact and almost half of vacationers using them to take pictures and schedule wake-up times. They also use their mobile devices to make reservations, get directions, check online reviews, and translate languages.